Whatever the reason, these farm animal activities caught my eye, and are great to have on hand whenever you talk about farm animals in your classroom or when your child shows an interest. Itsy Bitsy Fun has a free printable farm animals memory game that kids are sure to love. There are six animals included, and you can use the pieces like a puzzle and to play a memory game. So cute! Want more farm animal fun? 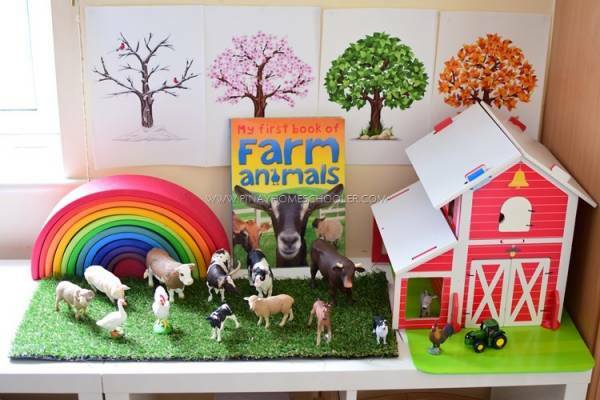 Pinay Homeschooler has a great collection of Montessori-inspired farm animal activity ideas, which take a little more in terms of preparation and supplies, but you probably already have some farm animals and other items that can be used for these activities. And there are free printables to go with some of them, too. Isn’t that table lovely? And I love the “milking cows” idea!